This month's Rue Morgue Cinemacabre screening was a new horror flick from Ireland called Wake Wood. Patrick and Louise, (Aiden Gillen & Eva Birthistle) devastated by the loss of their only child, are given the chance to spend three more days with her. Only Alice doesn't seem to be exactly like the daughter they knew. 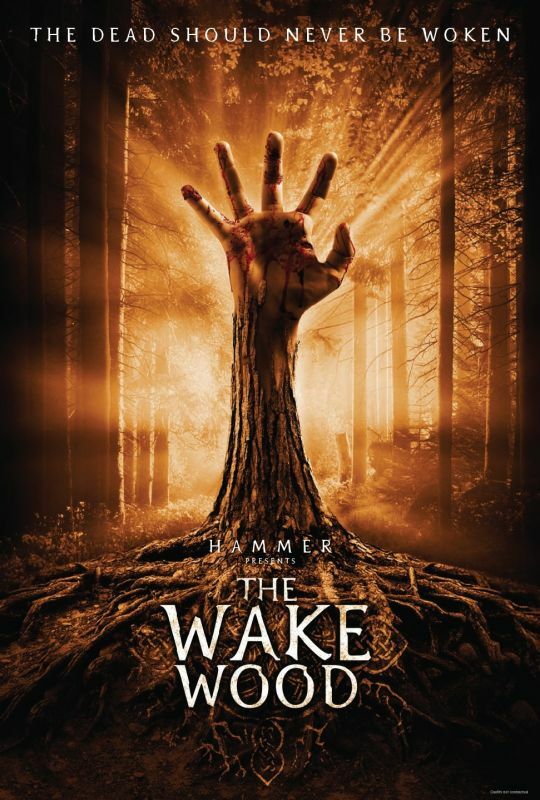 Wake Wood is a movie that relies heavily on its influences. Just the by-line above will no doubt have you thinking of Pet Sematary, but it also borrows heavily from vintage British classics Don't Look Now and The Wicker Man, as well. However, Wake Wood does manage to project its own voice through the din of its many references. There is a sincerity to the proceedings, that I found endearing for the most part. It starts off very strong, with a well edited and wonderfully scored opening credits sequence and then shifts gears into a more traditional piece. It had its share of lulls where my mind wandered, but that could've just as easily been from the three pints I had before walking into The Bloor. Wake Wood is anchored by the performances of its leads. Gillen and Birthistle are solid as the grieving parents. You can see the weight of their loss and hence their actions are made at least somewhat believable. Ella Connolly, who plays the resurrected Alice, is also very good, employing a restraint that only adds to the creepiness of the role. I thought she beared a striking resemblance to one of the murderous kids in Tom Shankland's The Children. If Connolly hadn't been billed as “Introducing”, I would have thought it was the same actor. I mean they've even got the same coat! Ella Connolly (left) and Eva Sayer. You know what's funny though? That I didn't notice, until I looked it up, that the mother in Wake Wood is ALSO the lead in The Children. How did I miss that one? I would say the rebranded Hammer Films has a pretty good track record so far. I haven't seen The Resident with Hilary Swank, but as you know, I was quite impressed with Scott Reeves' Let Me In. This lastest offering is pretty sedate, with little flash, but it gets its sentiment across rather well. If you prefer your horror more on the gothic side, than the in-your-face styles of late, I would urge you to take a trip to Wake Wood. The little girl in The Children - she's not called Eva Sayer. Her name is Raffiella Brooks. Glad someones paying attention... you're right, Eva Sayer was the OTHER crazy little girl in The Children.